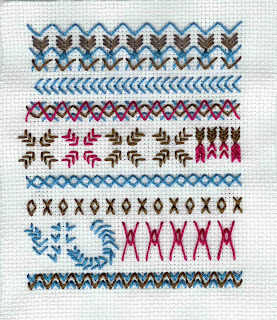 Here's my TAST sample for Arrowhead stitch. As well as arrows I seem to have ended up with tulips, more snowflakes, inadvertent cross stitches and noughts and crosses! This is a wonderful sample Lynne. Lynne, this is a delightful sampler! I love every row on it. You've made me recognize afresh what a great stitch it is.